The best new markets for advisors are in increasingly far-flung places, away from traditional financial hubs like New York and Los Angeles. One year ago, fed up with California’s politics and taxes, advisor John Graves decided to look elsewhere to live and work. Graves grew up in the South, his wife, Sharon, in the Midwest. “Our quest turned into a ‘Where do you want to fly this month, honey?’,” says Graves, managing principal of The Renaissance Group, an advisory practice in Ventura, Calif., with $560 million in assets under management. Graves, 65, is an adventure traveler who has visited more than 84 countries. No surprise then that he conducted his search for The Next Best Place with vigor. Suburban Virginia outside of Washington, D.C.? Too much traffic. Maryland, with the nation’s highest percentage of millionaires per capita, had a mosquito problem. Florida? Hot and muggy—plus it’s overserved by financial advisors. Texas? Hot and dry. Alabama had an attractive cost of living but, again, the weather. Coastal South Carolina was lovely, only it didn’t have an abundance of underserved high-net-worth households. Ultimately, Graves settled on Raleigh, N.C., which he likes because of its affordable cost of living, diverse political makeup and an underserviced high-net-worth market in the Raleigh suburbs. He is currently looking to buy an advisory business there—although he will continue to service his 89 clients in California through Skype and quarterly visits. His California staff will also remain in place. Graves, it turns out, is at the forefront of a trend that represents a potential industry game changer: the shift of finance jobs from traditional financial centers like New York City, Chicago, San Francisco and Los Angeles to places like Raleigh. In a survey last year of the “Best Cities for Jobs in Finance Industries,” Richmond, Va., and Pittsburgh placed first and second, respectively, among the 66 largest metro areas in the country. Raleigh ranked 49th, three spots above New York City. Futurist Joel Kotkin, executive editor of NewGeography.com and a co-author of the survey, says the financial services industry appears to be undergoing a “profound” geographic shift away from traditional money centers. What’s driving it? Cost-cutting by firms and the growth of educated workforces in many smaller metropolitan areas. The linguistic skills of a largely Mormon workforce in Salt Lake City, for example, have attracted the presence of big financial firms that need employees who speak Lithuanian, Chinese and Tagalog. Salt Lake City ranked 12th in the survey. A parallel trend that Kotkin says will grow legs over the next decade is the migration of young adults and aging baby boomers to so-called “second-tier” cities. For young adults, the move is all about getting more bang for their employment buck. As Kotkin puts it: “If you make $110,000 a year in Salt Lake City, you live really well. If you make $110,000 a year in San Francisco, you live in a closet.” Boomers, meanwhile, are looking to preserve their nest egg. “If we all had endless money we could all live in Manhattan or Boulder but most of us have to make other choices. How would Columbus, Ohio, be? Maybe I don’t want to live in a dying Rust Belt city but how would a restored neighborhood in Richmond be or a leafy suburb outside St. Louis? That begins to become a value proposition,” says Kotkin. A number of firms, large and small, have begun to develop geographic strategies to help them grow their business. The big reveal: Opportunity exists, literally, all over the map. Tash Elwyn, president of Raymond James & Associates’ Private Client Group, looked at that map and here’s what he saw: the West Coast, where 22% of the industry’s assets under management are held. Here’s what he didn’t see: a sufficient RJ&A presence. Just under two years ago, the St. Petersburg, Fla.-based broker-dealer began its push westward in earnest, opening new branches in California, Washington and, most recently, Oregon. The firm is also considering Tulsa, Baltimore and Boston as possible expansion sites. When it enters a new market, RJ&A doesn’t open a branch that looks cookie-cutter corporate. It really does go native. As an example, when the Portland, Ore., office opened in October, the local advisory team decided to forego a traditional downtown high-rise in favor of office digs in a restored brewery in the city’s jumping Pearl District. The neighborhood has become a destination for restaurants, high-end retail, galleries and tech companies. RJ&A was one of the first national wealth management firms to move into the neighborhood. 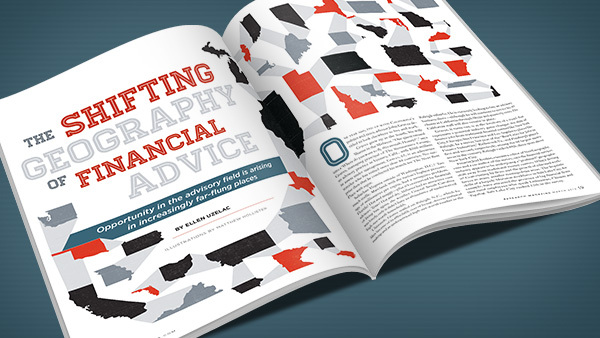 Two other firms—the well-established Argent Financial Group and relative newcomer Fusion Wealth Management—could not be more different but both are investing in serious geography plays. Argent, a southern heavyweight headquartered in Ruston, La., has just short of $6 billion in assets under management. By contrast, the three-year-old Fusion, based in Phoenix, manages $56 million in assets. Yet both are “following the money” to places like Ohio, Texas, Tennessee and Kentucky. So when the shale oil boom hit in southwest Louisiana a few years ago, Argent created a property services group to advise client landowners on their negotiations with real estate and oil companies. Or, as Buchanan puts it, the firm helped clients “monetize” their newfound wealth. Similarly, Argent moved into Texas to address the emergent wealth created by the oil and gas industry there. Argent also opened offices in Nashville and Louisville because of their high concentration of health insurance, medical technology and hospital groups. And it established a presence in Tennessee specifically to advise on the state’s situs laws involving asset protection. Fusion, meanwhile, has used its own geography to great advantage—courting local tech entrepreneurs and professional baseball players in Phoenix every year for spring training. It has also made two big pushes: one to San Francisco to capitalize on its expertise with serial entrepreneurs and the other to the Toledo, Ohio, area where, through a referral from an Arizona client, the firm connected with a cluster of high-level executives at major corporations. Fusion plans to open a Toledo satellite later this year. Any conversation about the shifting geography of financial advice should also include something that has no borders or bricks and mortar: the Internet. FutureAdvisor, a four-year-old robo-advisor backed by the venture capital firm Sequoia Capital, is targeting young urban professionals on promising career tracks, many of them working in West Coast tech. The firm, a passive investment advisor that manages $60 million in assets, has also seen a demographic spike in both young parents and pre-retirees moving through their 50s. The average account size is $137,000. Then there are folks like Michael Solari, a certified financial planner just starting out who heads Solari Financial Planning in southern New Hampshire. With Google getting over 15,000 searches a month for “certified financial planner,” Solari created a website to draw in traffic. He blogs. He follows Jerry Seinfeld and financial journalist Jean Chatzky on Twitter, whom he often retweets. And he has had inquiries from potential clients from as far away as Ohio. He just opened a 529 for someone in South Korea through Skype. That Pittsburgh ranked No. 2 out of 66 large metro areas in a “Best Cities for Jobs in Finance Industries” survey comes as no surprise to Jim Holtzman, personal CFO and shareholder of Pittsburgh-based Legend Financial Advisors, currently celebrating its 20th anniversary. Since the steel industry tanked in the 1980s, Pittsburgh has worked hard to reinvent itself. Collaboration and innovation have both played big roles. Today, Holtzman says, the city is known for a strong university presence, thriving medical community and tech players like Google and Apple. PNC is the nation’s fifth-largest bank, and out-of-state wealth managers have begun to open shop. The Marcellus shale is also minting new millionaires. The energy business has become so robust, in fact, that oil companies have been forced to import their own talent. And that has led to a major hotel boom with some forward-thinking hotels offering drillers “cleaning stations” and breakfasts that start at 2 a.m.